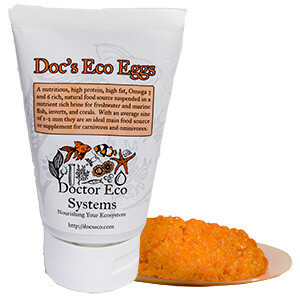 We’re always on the lookout for new cool reef foods to drive our tank crazy, and wow, does Doc’s Eco Eggs deliver! This brine-stabilized blend of fish eggs comes in a squeeze type tube that needs to be refrigerated after opening. The mixture is mostly solid, and due to negative buoyancy in this form you need to mix it with tank water to get it to break up sufficiently before adding it to your tank. We added a bit of water, shook it up a bit and then dumped it right into our Vortech MP40. WOW. The eggs are mostly buoyant when mixed so they fly around the tank for a while before settling. The fish really do not allow them to reach the bottom unless we add a lot, as this appears to be super yummy for our saltwater inhabitants. The fish go into near frenzy state trying to grab as many eggs as possible, and the size of each egg is just big enough for fish to make a good meal out of it, while allowing all sorts of corals and scavengers to enjoy the rest. Our LPS corals basically freaked the f- out, exhibiting some serious feeding behavior. Also the eggs were captured by SPS as long as we had the pumps turned off after adding the eggs. The eggs can be captured by even our smallest acros, and should they land on zoanthids you’ll see them sucked up quickly as well. Honestly, I’m not sure I have seen a feeding response this good in a while. The only complaint we have about the food is that the hole in the tube is a bit too small to make dispensing easy, and we are indeed trying to get every last bit out of it if we can. I’m sure this will be improved upon in future versions. We’re going to be on the lookout for these eggs in our LFS for sure, you can find a list of stores that carry the eggs or ask your local shop to consider adding them.